Basic training is anything but basic. Preparing the body for Army basic training will demand the best from you -- and then some. The elite offices of the military do not allow anything mediocre to pass through their training protocol. Therefore getting fit and strong in preparation for this life-changing endeavor is of prime importance. Every area of fitness will be tested, from strength and mental stamina to overall endurance. Creating a dynamic training regimen is essential to get ready for basic training with the Army. Complete split workout routines with a morning and weekend workout in the same day. You can perform 35 to 45 minutes of cardiovascular training in the morning with mixed intervals of intensity, with an afternoon workout of resistance training lifting heavy weight, or vice versa. Do not work on resistance in the morning and the evening, as adequate recovery is essential to optimal fitness gains, observes Stew Smith of Military.com. Run every weekday for 4 to 5 miles, as a cardiovascular option on the split schedule mentioned in step one. The Army requires a 2-mile timed run for their basic training tests, and consistent running will get your body acquainted with the exercise. 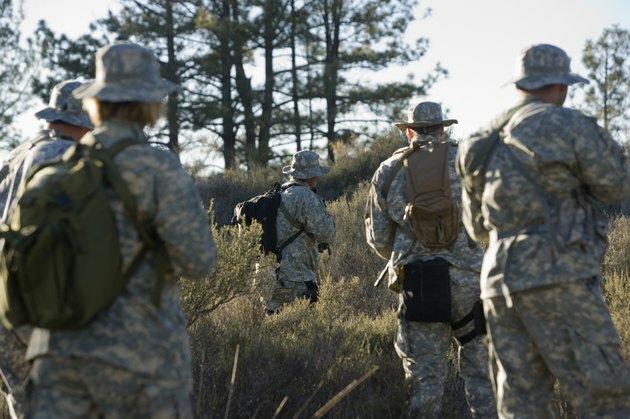 The more comfortable you are on your feet and in motion, the more successful you will be at basic training camp. Complete hundreds of pushups every other day in combination with your cardiovascular training and other resistance techniques that develop the upper body. Chest presses and flyes will help strengthen the chest muscle, but nothing can prepare you for the pushups, except actual pushups. Focus on the depth of the pushup, as well as the full range of motion, your back position and the overall quality of the movement. Incorporate weighted situps into three workouts per week. Two minutes of situps is required for basic skills of the Army training tests, so weight your abdominal routines by clutching a weight plate to your chest or holding one behind your neck. Increase the repetitions as often as possible to get comfortable with the sit-up motion. Employ a variety of core-building exercises from twisting, leg lifts, decline crunches and oblique side bends, to initiate strength gains in the entire core of the body. Stretch your legs aggressively, specifically the hamstring, for holds of 25 to 30 counts every day. Flexibility is vitally important to fitness and preparation in avoiding injury. Stretching is tested in basic training as well, and men usually struggle with flexible hamstrings. So use your training blocks to incorporate challenging stretching routines for 10 to 15 minutes each day. If you have previous injuries, speak with your health care professional about her recommendations for you moving forward with basic training. How Much Running Will I Do at Marine Basic Training?